On Earth, helium is a gas used to float balloons, as in the movie "Up." In the interior of Jupiter, however, conditions are so strange that, according to predictions by University of California, Berkeley, scientists, helium condenses into droplets and falls like rain. Wilson's co-author, Burkhard Militzer, UC Berkeley assistant professor of earth and planetary science and of astronomy, noted that "rain" – the water droplets that fall on Earth – is an imperfect analogy to what happens in Jupiter's atmosphere. The helium droplets form about 10,000 to 13,000 kilometers (6,000-8,000 miles) below the tops of Jupiter's hydrogen clouds, under pressures and temperatures so high that "you can't tell if hydrogen and helium are a gas or a liquid," he said. 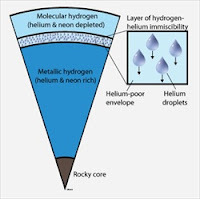 They're all fluids, so the rain is really droplets of fluid helium mixed with neon falling through a fluid of metallic hydrogen. The researchers' prediction will help refine models of Jupiter's interior and the interiors of other planets, according to Wilson. Modeling planetary interiors has become a hot research area since the discovery of hundreds of extrasolar planets living in extreme environments around other stars. The study will also be relevant for NASA’s Juno mission to Jupiter, which is scheduled to be launched next year. Militzer and Wilson are among the modelers, using "density functional theory" to predict the properties of Jupiter's interior, specifically what happens to the dominant constituents – hydrogen and helium – as temperatures and pressures increase toward the center of the planet. These conditions are yet too extreme to be reproduced in the laboratory. Even experiments in diamond-anvil cells can only produce pressures at the Earth's core. In 2008, Militzer's computer simulations led to the conclusion that Jupiter's rocky core is surrounded by a thick layer of methane, water and ammonia ices that make it twice as large as earlier predictions. The two modelers embarked on their current research because of a discovery by the Galileo probe that descended through Jupiter's atmosphere in 1995 and sent back measurements of temperature, pressure and elemental abundances until it was crushed under the weight of the atmosphere. All elements seemed to be as slightly enriched compared to the abundance on the sun – which is assumed to be similar to the elemental abundances 4.56 billion years ago when the solar system formed – except for helium and neon. Neon stood out because it was one-tenth as abundant as it is in the sun.